Preheat the oven to 350. Combine the chicken with the green chilis and salsa. 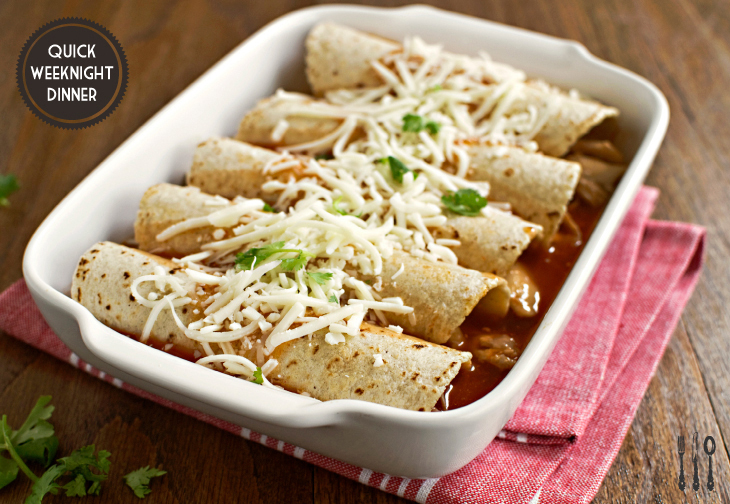 Pour a bit of the enchilada sauce into a 9-by-13-inch baking dish, just enough to coat the bottom. Wrap the tortillas in a damp paper towel and microwave on high for 30-45 seconds. Fill each tortilla with about 1/4 cup of the chicken mixture. Roll the tortilla tightly and place seam-side down in the baking dish. The dish will be snug with the rolled tortillas. Pour the remaining sauce over the tortillas and top with the shredded cheese. Bake for 25-30 minutes, or until the enchiladas are heated through and the cheese is golden- brown. Remove from oven and let cool 5 minutes. Serve hot with fresh, chopped cilantro, chunks of avocado and a squeeze of fresh lime.